s there anything cooler than a cooler with wheels? Quite literally, no there isn’t, not out in the wilderness anyway. These things will be able to store your food, be used to be able to carry other items via being pulled along on wheels, and most importantly, keep your precious beers sitting at just the right temperature for days on end. We have to be honest here, but cold beer is one of life’s priorities. They are easily more important than sauce on your burgers, bait on your hooks, bear spray, mosquito nets, clean socks, or anything else that you might need when fishing, hiking, camping, or enjoying a day at the beach. If you think otherwise, you’re seriously on the wrong website – cold beer is a an absolute necessity rather than a luxury! Right, with that out of our system, we might as well get started on showing you some of the best coolers with wheels that your money can buy. 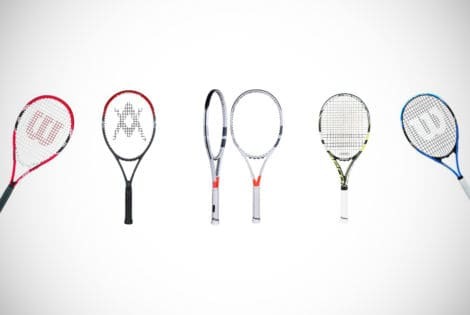 We have reviewed 15 of these bad boys and tested them extensively. We have cooled hundreds of beers for the purposes of these tests and of course, drunk them all at various times in order to surmise how good each cooler is. We have put ourselves through every step of this testing to find which cooler cooled best, which cooler rolled best and which cooler we think you should be buying to make that ultimate “too cool for school” statement. It was a difficult job but we are always more than willing to put in the hard yards in order to help you make the right decision on any product. So anyway, without further ado, here are the top 15 coolers with wheels that you will be able to find in 2019. These are not ordered in any particular order by the way, as while that was the original plan, they all got kinda mixed up after about the 7th beer so we gave up on that plan. What are the main things to consider when buying a cooler? Surely the first answer to this question is quite obvious? How many beers can a cooler hold and keep cool? 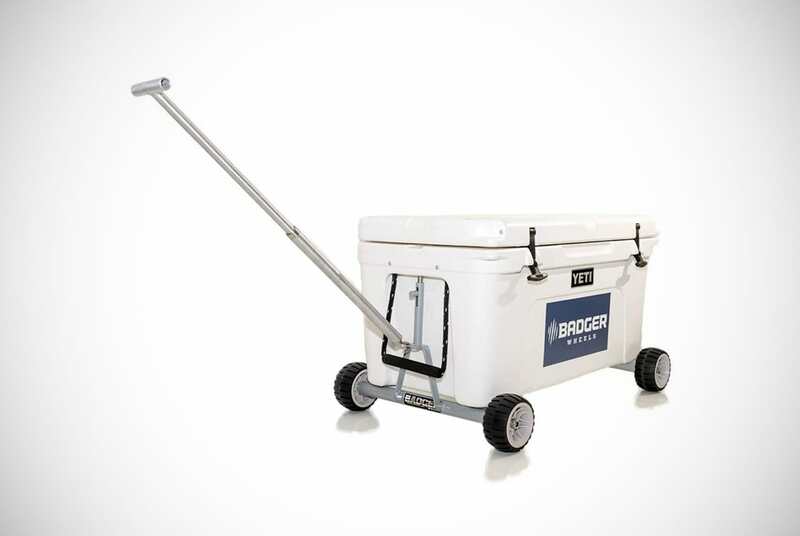 You want a cooler with wheels that has ample space and can hold at least a case of beers in our opinion with a few inches of space for other less important stuff like food and water. In all seriousness though, there are a number of factors you will want to consider before buying a cooler with wheels. Durability is very important as you will be taking these things across rough terrain. How many days of ice retention you’ll get is another, especially if you’re planning longer trips away from home. Ice retention is crucial to maintaining that chilled beer groove – what could be worse than finding that you’ve hiked for hours only to crack open a lukewarm brew? You’ll then have to consider how much storage space a cooler has, how light and portable it is, whether it is leak-proof, and any of the other features that it might have. Regarding the latter, some will be able to double up as seats or tables, will have extendable handles, cup holders and built-in bottle openers, and even some LED lights on the inside. As you can see, while your beer and its coolness is the most important thing with a cooler, there’s actually quite a lot of other factors that you should be thinking about before making a purchase. Some of you will even consider the color or design of a cooler if that is something that’s important to you. What are the main benefits of wheeled coolers? If you’ve ever tried to lug around a cooler that does not have any wheels when it is filled to the brim of beer, you’ll understand that this is not an easy task. In fact, you’ll probably need two of you to carry it about. This, of course, is fine if you’re only going to be moving it short distances at a time but if you’re planning on camping, hiking, fishing, or other activities that will mean it needs to be carried quite long distances, you’re going to struggle massively. Thankfully, we as the human race are quite smart and a few years back invented these things called wheels. Pretty smart right? Well, an even smarter person then came up with the idea of putting some of these things onto the bottom of coolers so that they could be pulled around. Genius or what? Forget landing on the moon, this was the single most important moment in the history of the human race! The ultimate “Eureka” moment for beer coolers! So simply put, being able to move around your beer and food in a far more effortless manner is without a doubt the benefit of owning wheeled coolers. Are there any other benefits to them? Sure, they do the all-important task of keeping those wonderful tasting beers cold for when you’re ready to sit down, relax, and get completely hammered. Or sit and watch the sunset with a beer. Or two. Or three. Or just getting hammered, of course! How long do coolers keep drinks and food cold for? Seeing as this is the primary purpose of a cooler, this is something you’ll want to learn about any particular model you’re considering buying beforehand. Some will be able to keep your beers cold for a good day or two while some of the better performing coolers will be able to keep you in a good supply of cold beer for longer than a week in hot weather. You have to remember that not all coolers are the same in this regard with many cheap coolers which are obviously not included on our list, are not the best at retaining ice for long. There really is nothing worse than opening a cooler after just a few hours in hot weather to find a pool of water and lukewarm beers already. Coolers with the better reputations are the ones to go for as they will state how long their coolers will retain ice and will generally be very accurate with what they’re saying. Some will openly admit if their cooler is designed to keep your stuff cool for a day, a few days, or for up to a week. Of course, you can expect to pay more for those that keep your ice for longer but this extra is certainly worth it if you’re planning extended trips. So to kick things off we’re going to start with a 50-quart cooler from Coleman that will allow you to keep up to 84 cans of your favorite beer cool for as long as five days at a time…that is if your beer lasts that long anyway. 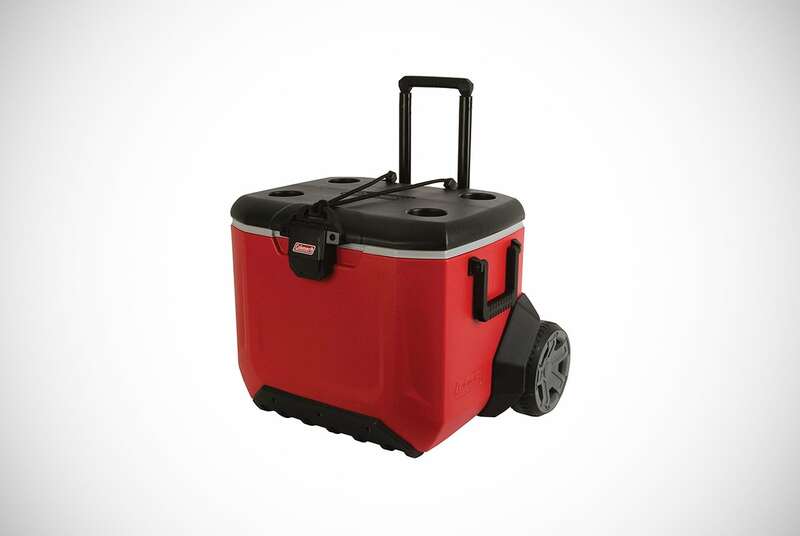 The 50-Quart Xtreme 5 Wheeled Cooler is just one of a number of coolers from Coleman that you’ll find on our list which only goes to show how good and popular this affordable brand is – anything camping-related seems to have a Coleman product involved, so you know that you are dealing with experts in the field. Coleman also likes to make sure that their coolers are more than just coolers by implementing some handy features. There are four cup holders molded into the lid which means you have a ready-made place to place your refreshing drinks while its sturdy design also allows it to become a chair – one that will cool your behind on hot days too! You also have some of the more common features associated with coolers such as a telescopic handle and some heavy duty wheels which are both designed to make it easier to pull over rough terrain. Any ice that you place inside this Coleman cooler with wheels will be retained for a good five days in heats of up to 90 degrees Fahrenheit. Igloo is another name that you’re going to see a few times on this list as they specialize in making some of the most popular ice coolers out there at the moment. Their Ice Cube 60 Roller is the first of theirs that we’ll be taking a look at and due to its low price it is an excellent option to consider. This ocean blue cooler provides 60-quarts of storage which is larger than the Coleman above but due to its dimensions it actually holds a fewer amount of beer cans. Sacrilege right? Well, it’s not too bad as you will still be able to sup on up to 72 cans of beer on your trip. As for how long this cooler will keep those cans dry, you’re talking a good couple of days up to a heat of 80 degrees Fahrenheit. Made of polyethylene, this solid cooler has a push button activated telescopic handle and two wheels that will help you move the thing around easier. You also have four cup holders on the top for when you want to crack open a few of those beers with your friends. All in all this Igloo cooler with wheels is a decent option to have and great value for money. 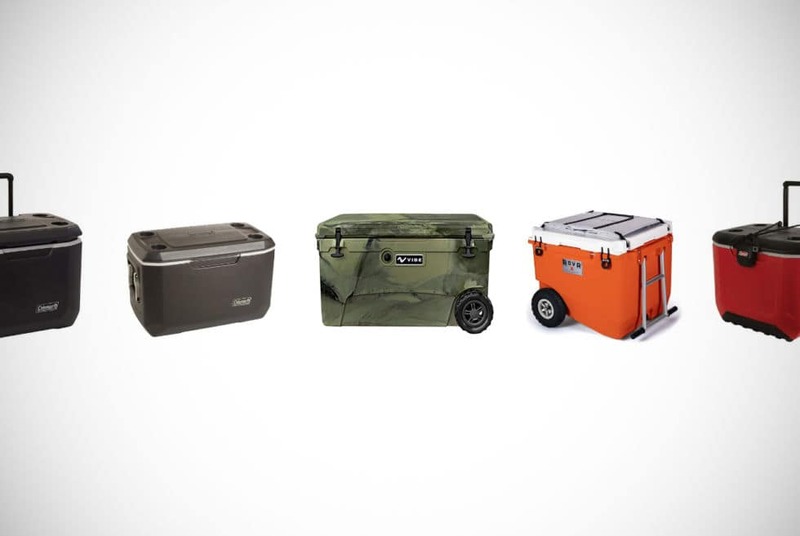 If you wanted a cooler that is more rugged and that’ll be able to handle the rougher types of terrain you will witness when camping, hiking, and whatnot, the Coleman 55-Quart Rugged A/T Wheeled Cooler is one that we suggest you take a look at. It offers up large heavy-duty eight-inch wheels that have been designed to make traversing over rough terrain that so much easier. 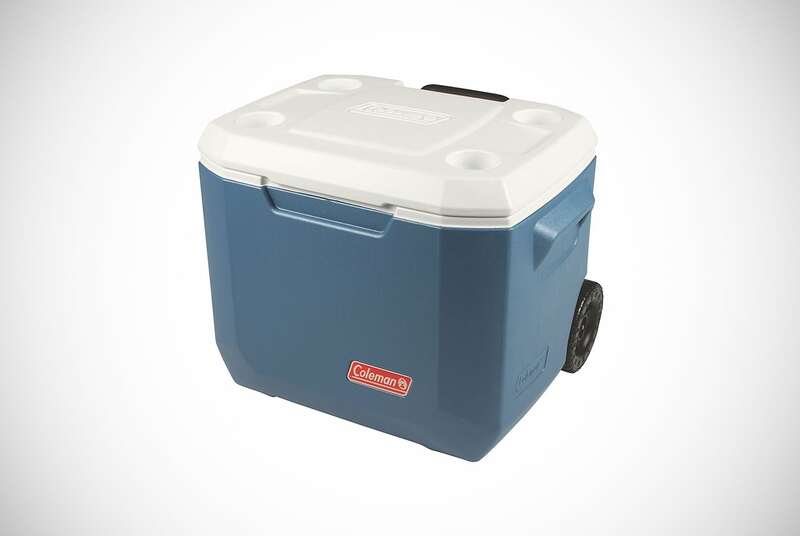 Much like the other cooler with wheels from Coleman earlier on, this one will keep your food and beverages cool for up to five days in sweltering heats of up to 90 degrees Fahrenheit. Being 55-quart it will also allow you to store ample amounts of beer, food or whatever else you want to keep cool. 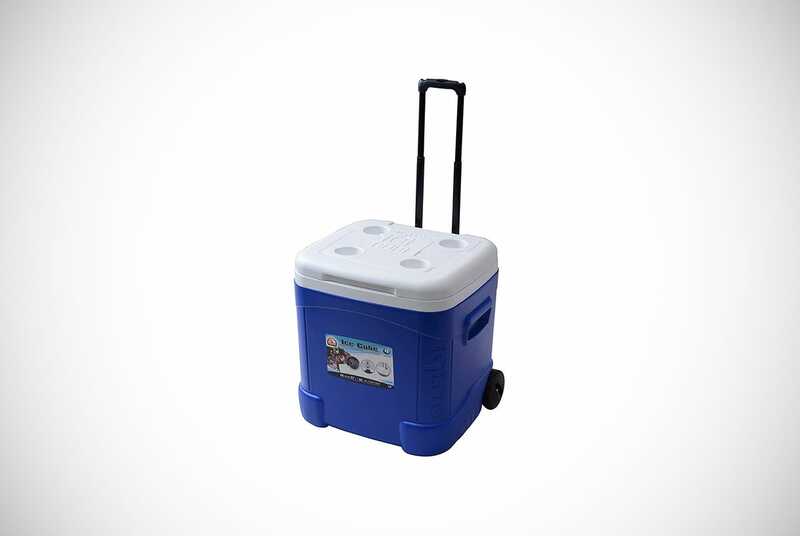 Other features of this cooler with big wheels include that of a locking telescopic handle, two anti-pinch side handles, four convenient cup holders in the lid, and a handy seat lid that will allow you to take your feet off for a while when hiking. 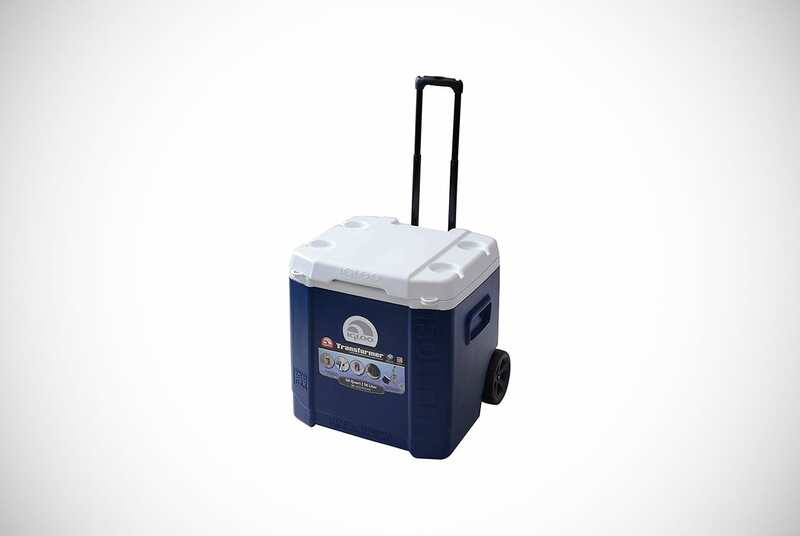 This is an ice cooler on wheels that we would recommend to those that plan to use it a lot and in harsher environments. 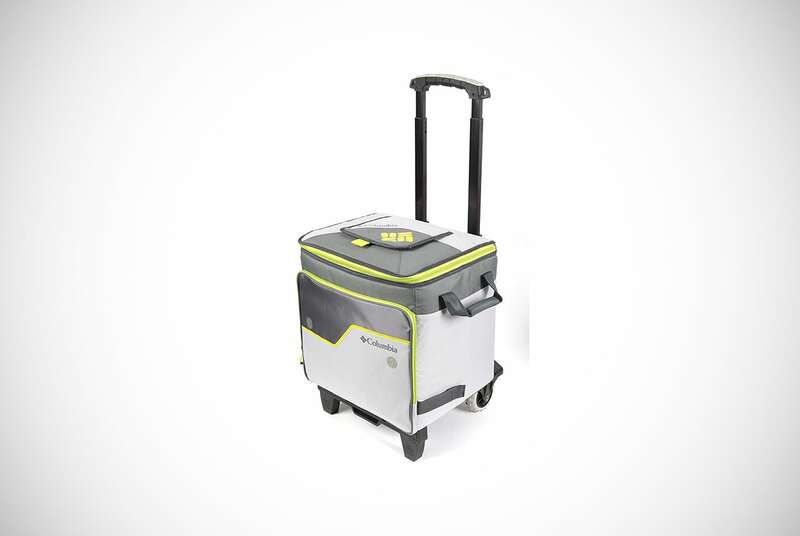 Well, we did warn you that there will be a few coolers from Coleman on our list and this 50-quart portable cooler on wheels is the latest of them. Utilizing the same heavy duty build that you will find across all Coleman cooler products, this is ideal for bringing along on hiking trips, to music festivals, or for some simply camping with friends. Most of you will be thinking about cold beers but this cooler will also be able to store food. Yes, we know that stuff that is not quite as important as beer but certainly something you’ll need to consume at least sometimes – but we understand the need to limit the amount of solids you want to put into your hydraulics on your trips! It will actually retain the ice that you put inside for as long as five days in hot conditions which means some ice cold beer for almost a week. Furthermore, those beers when being drunk can be placed in the very handy cup holders that have been molded into the lid. Additionally, that lid also makes for a very convenient seat too but just make sure you take the cups full of beer off first. As for the style, if that’s really something that you find important with a cooler cart on wheels, you will be able to choose from a variety of color schemes. If you really take your hiking, camping, or any other activity that will require you to bring a cooler along seriously, then you’re going to want a seriously good cooler. The Trailmate Liddup from Igloo is certainly that but it will set you back some serious cash compared to the others in our reviews so far. Firstly, this thing is big and with 7-quarts it will hold up to 112 cans of your favorite beer. Secondly, it comes packed with additional features such as LED lights that light up when you open it in the dark, big cooler wheels designed for rough terrains, a pullout removable butler tray, built-in bottle openers, and even some built-in fishing pole holders. What we find most impressive about this big cooler with wheels is the build quality. It has aluminum and stainless parts rather than all plastic parts found in cheaper coolers. 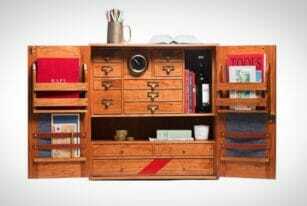 We also love how sturdy this thing is but considering the price we would not expect anything less. If you have a big trip planned or often go out into the wilderness with friends, this Igloo cooler is one we suggest you think about buying. Can you put a price on cold beer? We think not. If you were looking for an Igloo cooler with wheels that offers up ample storage and plenty of features but do not quite have the budget for the excellent Trailmate Liddup above, you might just be interested in their Latitude 60 Roller instead. 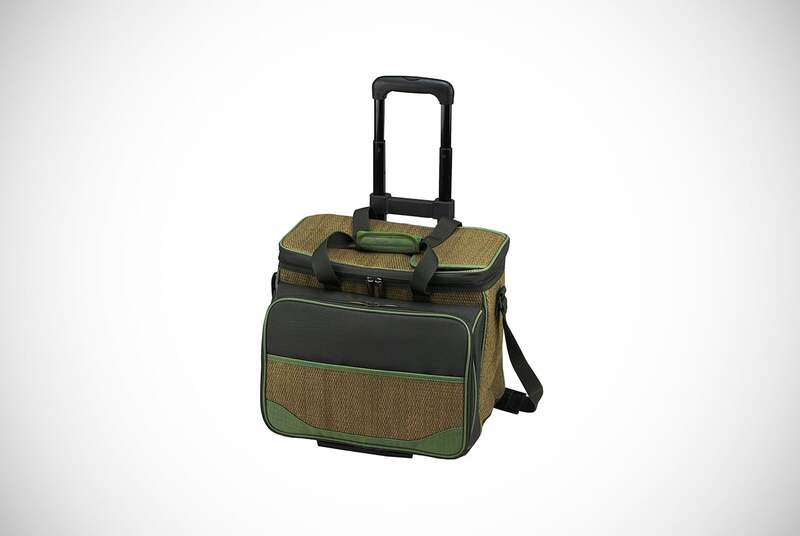 Ideal for weekends away fishing, hiking, or partying, you will be able to keep food and drinks for days on end. Although this is a fairly basic standing cooler on wheels, because it is made by Igloo, you can be confident that you’re getting great value for money. It has a solid build, will keep ice cold for as long as five days at a time, and has features such as cup holders, telescopic handle, and a mobile stand that you can use to place your phones, keys, or anything else of importance. Leak resistant and using their innovative Cool Riser Technology, Igloo has once again created an affordable cooler that we are confident you’ll be delighted with if you were to purchase it. In fact, in terms of value for money, we have to say that this is one of the best coolers with wheels on our list. Although this is up there with the most expensive coolers on our list, the Vibe Element 70 is easily one of the best coolers with wheels that you will find. One of the best things is that it looks as good as it performs – that camo finish is just perfect when out camping, hiking, fishing etc. 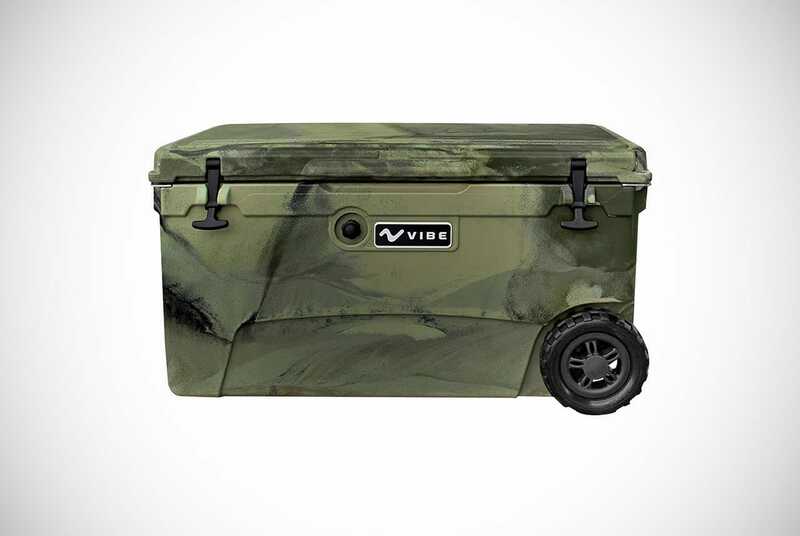 This is a nice change from the bright colors of other coolers that don’t fit with the need for camo-driven trips. As well as its obvious good looks, you can also enjoy its superior durability to almost any other cooler out there and its excellent features such as heavy-duty handles, integrated locking system, tie-down slots, and built-in bottle openers. It will also be able to keep ice for more than five days which means plenty of cold food and drinks whenever you need. For all you beer lovers out there, this cooler will store up to 110 cans of beer but it probably will not be cold unless you use some of the space for some ice! At a 50/50 ratio of ice and beer, this means that you are looking at up to 55 cans of ice cold beer that can be stored for 5+ days in hot days. We recommend experimenting with the perfect ratio – which is always a good excuse for a scientific trip! If you’re just planning a day out rather than a weekend or longer, the Picnic at Ascot Ultimate Travel Cooler is one that we feel you should take a look at. It is smaller than most on this list at 36-quarts but it will still hold up to 32 cans of drink and keep it cold for a good 24-hours. It also doubles up as a general carry case when not being used as a cooler. With detachable all-terrain wheels, you can simply pick up this bag and place over your shoulder when appropriate or put the wheels back on when the cooler is too heavy. 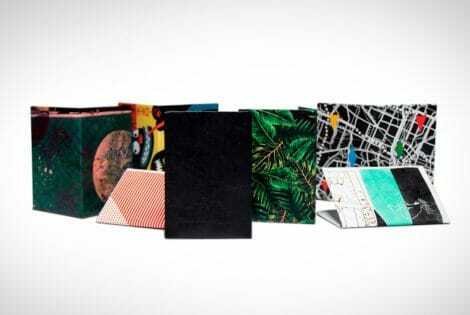 As for the case itself, it is made from heavy-duty materials and is puncture and leak resistant. Your food and drink will always be safe as well as cold. 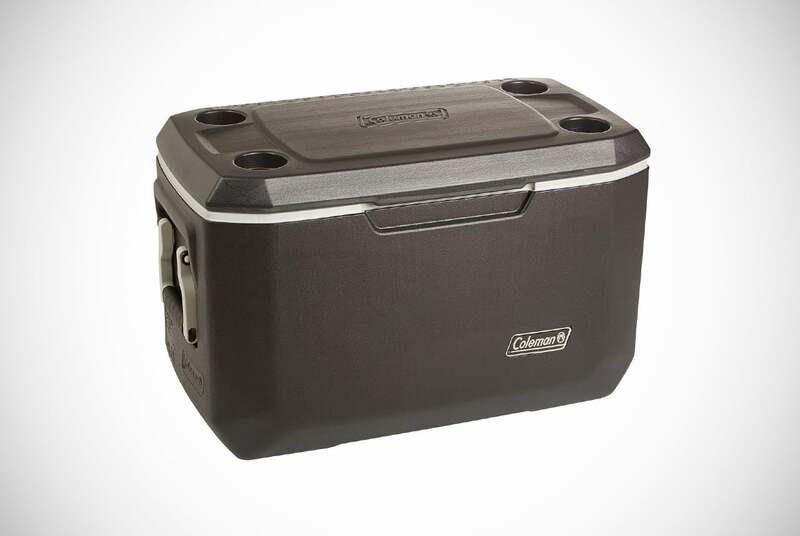 Summing up, this is the perfect cooler for shorter trips and is actually priced well too in our opinion. You can just imagine how much better a time you’ll have knowing that there is a cold beer waiting for you whenever the need shall arise. Another option for any short breaks is that of the Columbia Crater Peak 50, a cooler on wheels that will allow you store up to 50 cans of beer and keep it cold for at least 24 hours. This cooler comes with detachable wheels which means if you have a lighter weight, you can simply carry the cooler around on your shoulders. Affordably priced, we have to say that the Crater Peak which has SuperFoam insulation, is leak-proof and easy to clean, is ideal for picnics, days at the beach, or log drives. Whenever you need a cold drink or want to keep food fresh, you can simply open it up and grab what you need. It will be cold, fresh, and kept perfectly. A telescopic handle that is attached to the wheels can be used to pull this cooler around when full and when not in use, those wheels can be folded neatly away. All said and done, we have no problems with recommending this cooler as we feel it represents great value for money and good performance. 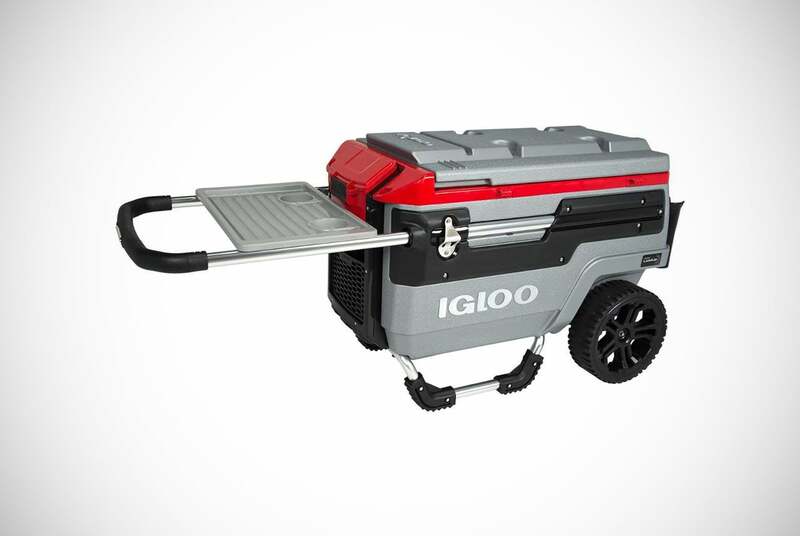 Igloo is back once again and this time with their 60-quart Transformer Roller cooler which offers up ample storage and features that will be extremely handy when you go camping, hiking or fishing. Any ice that you store inside to keep food and drinks cool will last a good 24-hours on hot days and even longer on colder days. 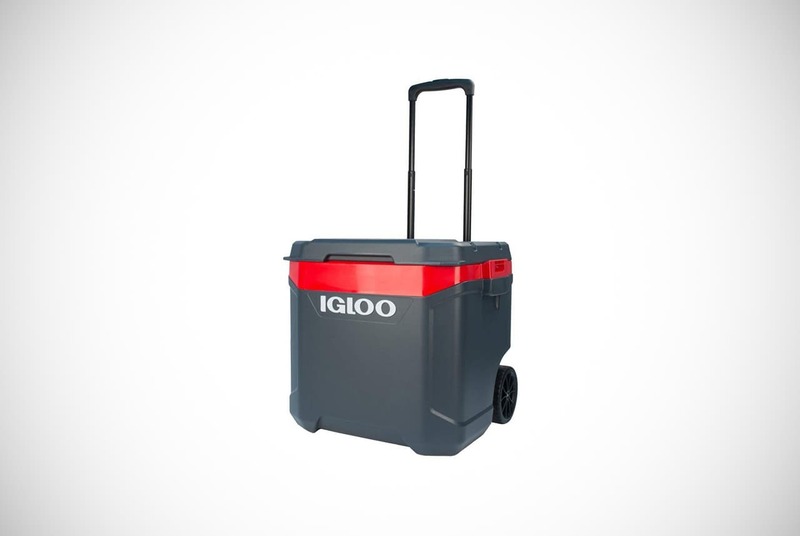 Igloo is known for their build-quality especially and that is what we like the most about this particular cooler on wheels. Not only does it perform well by lasting a day or more filled with ice but it is also extremely sturdy and durable, and comes with some features such as a telescopic handle and solid wheels as well. This cooler is also well-priced, another reason why Igloo coolers are so popular. Considering some coolers can cost three or four times what this one cost and that they are not that far ahead in terms of performance means that these represent a good deal. 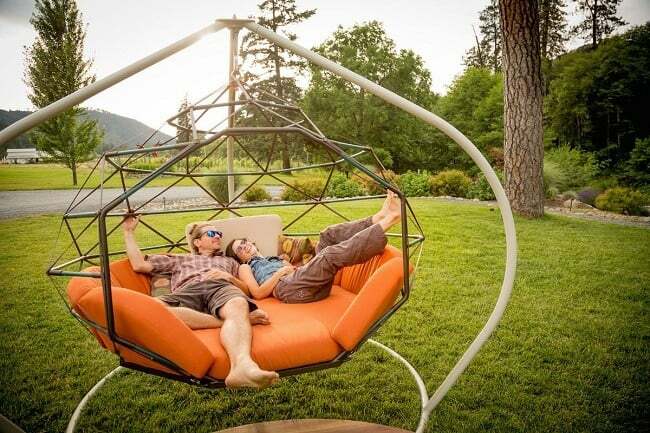 Sure, these are not ideal for longer trips but not everybody goes away for days. A good addition to game-day trailer parties, BBQs or just general trips where you need to bring the party with you. 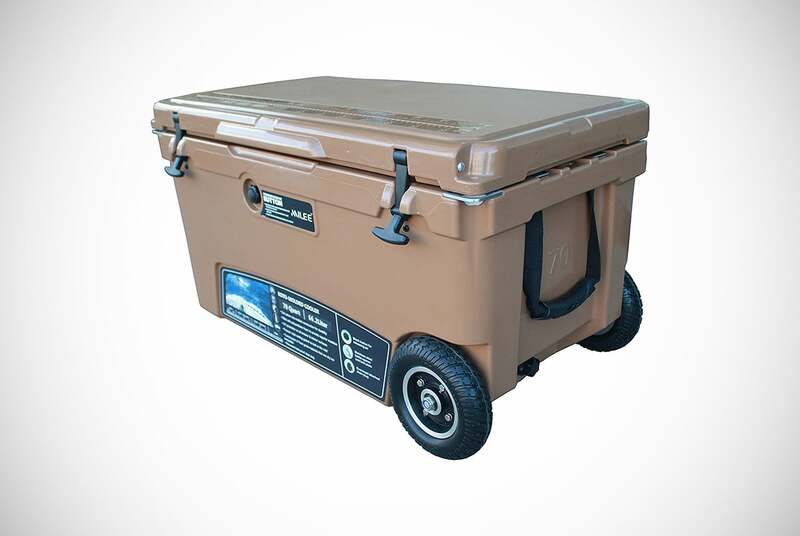 If you wanted something a little more heavy duty, you’re not going to get many that are as rugged, tough, and sturdy as the Milee Heavy Duty Wheeled Cooler. This thing is big, a bit on the expensive side, but also extremely good when it comes to performance and added features. It will keep ice for up to five days in hot weather, is pretty huge and will, therefore, store tons of food and drink, and has a bunch of handy features. The wheels on this thing are also big and tough and have been designed to allow for use on harsh terrain. They measure 7 inches in diameter and are made of a good quality non-grip rubber material. The cooler itself is constructed of what they claim to be an indestructible thermoplastic which just makes this thing tougher than Popeye after a can of spinach. Features such bottle openers, locking plates, drink holders, cutting board divider, and a basket is just the icing on the cake. We can assure you that this large cooler with wheels is going to give you everything that you will ever need when it comes to cold drinks and food out in the wilderness. It is 80-quart so will give you ample storage space for your food and beer, mainly beer of course, as you can just pick berries or something if you get a bit peckish. This is the “US Marine Corps” option of the cooler world – go anywhere, anytime, with any amount of chilled beers. 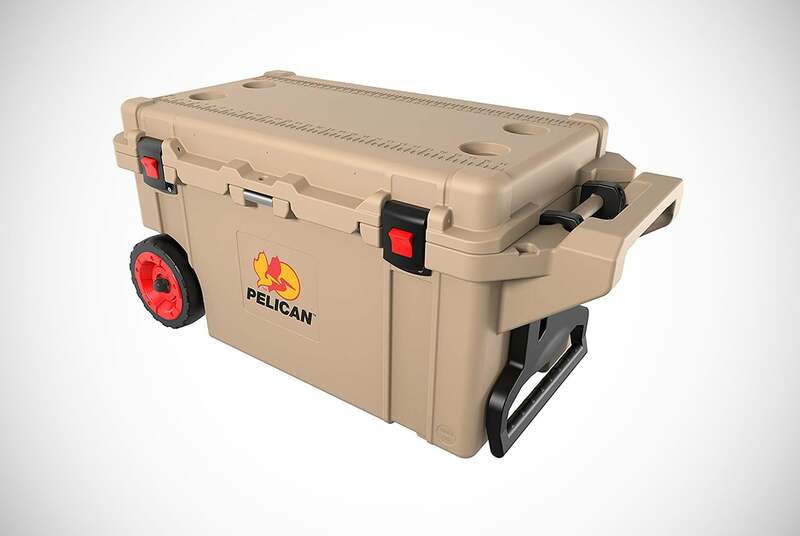 Another of the best coolers on wheels at Amazon in our opinion is that of the Pelican Elite Wheeled Cooler. This baby, much like the above Milee, is big, strong, durable, and packs in a good number of additional features other than just being there to keep your large number of six-packs ice cool. 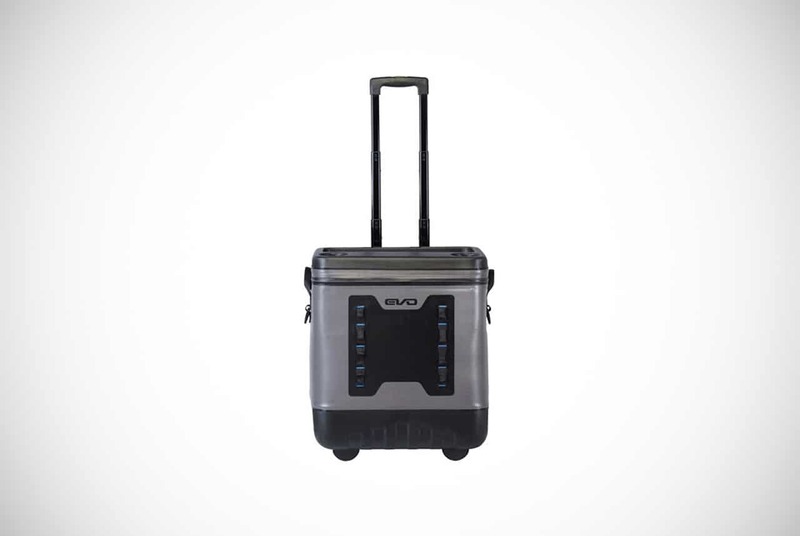 Astoundingly, this cooler claims to be able to keep its ice retention for up to 10-days which makes it the ideal choice for longer trips. Furthermore, because it is made of strong polyethylene for the actual cooler and has heavy-duty wheels, it will be perfect for even the roughest of terrains. On top of an excellent ice retention and solid build, this comes with a variety of additional features such as built-in bottle openers, a fish scale and cup holders on the seat, press & pull features which will keep it completely secure, and a built-in trolley handle. If you’re serious about your coolers and want one of the best on the market which also has a lifetime warranty, this is one you should definitely be considering. 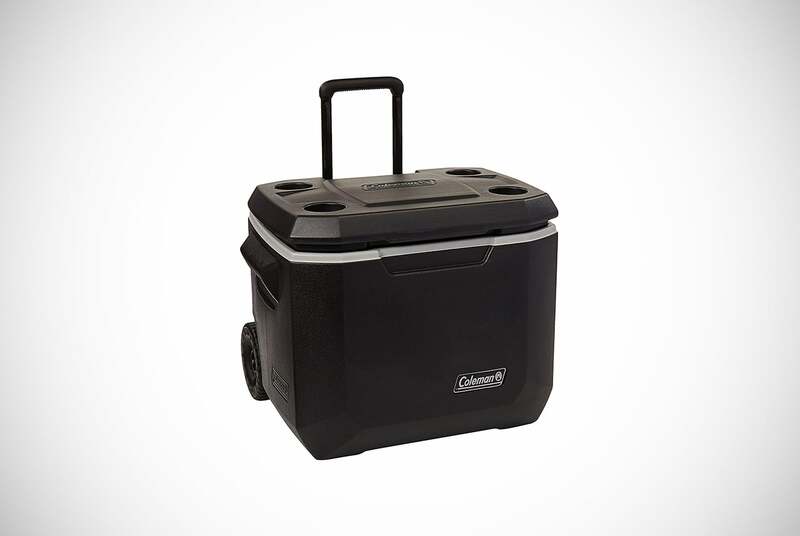 We’ve reviewed a number of Coleman coolers in this list and while this one is not technically a wheeled-cooler, it is extremely portable and should definitely be considered if you’re looking for a portable 70-quart cooler that is affordable. Whether you’re going to a barbeque, camping, or to the beach, this cooler when filled with ice will keep anything kept inside it nice and cold for up to 5-days. Carrying this nice looking cooler around is easily done as well due to no-crush handle grips on either end. Furthermore, you can also enjoy this cooler as a seat, rest your cups or cans of beer on it, and wipe it clean with ease. Now that we have talked about some of its big features, we thought we would tell you about the one that you’re likely to find even more important. This is the fact that you will be able to store a whopping 100 cans of beer in this cooler – more than enough for a solid contribution to any outdoor party that you attend. If you wanted something that is not an Igloo, Coleman, or Yeti cooler with wheels, the EVO Premium Rolling Cooler is one that you might consider. It is a 50-quart cooler that claims to be able to store up to 72 cans of beer at a nice and cold temperature for up to 72-hours. Where this differs from other coolers on the list, however, is that it has been designed to be extremely lightweight. This lightweight construction and design mean that it is one of the more portable coolers on our list. The best part is that this portability does not sacrifice the durability that the cooler provides. 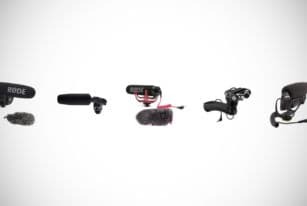 It is leak-proof, sturdy, and has all-terrain wheels that have all been designed to withstand quite a bit of abuse. Another great bonus with this cooler is that when you purchase it, you’re given a free pouch worth $25 that can be attached to the front of the cooler. This gives you additional storage space for items that do not need to be chilled. All in all, this is a great cooler whether you are planning some tailgating, a picnic with family, or some fishing with friends. Another cooler with wheels that is proving popular with campers, hikers, and partygoers is that of the RovR 80QT Roller. This is a very well made cooler that has obviously been designed to be tough, durable, and portable. Sure, it is a little on the heavy side even when empty but the aluminum wheels with 9-inch puncture resistant tires make moving this cooler very easy indeed. The solid build that the RovR possesses means that it is about as close to beer-proof as you’re likely to get with a cooler. When you consider that alongside the days of ice retention that this thing can provide and the additional features that it has, you can be sure that you have yourself a quality cooler for all kinds of occasions. You also have the choice of three different colors and a multitude of accessories that can be used with it which are sold separately. It might not be the cheapest cooler with wheels on our list but in terms of build quality, performance, and mobility, we feel it is certainly worth the cost. So, find your ideal beach, hike, trail or party cooler with big wheels among all that lot? If not then you’ve obviously been drinking far too much of that warm beer while reading our reviews. These are some of the very best coolers with wheels that you’ll find on the market right now. We have covered practically every type of budget, size requirement, and purpose with these coolers and are confident that there should be something that is the perfect fit for all of you. Some obviously perform better than others, some are more durable, some more portable, some will cost more than others, and some will just be a good all-around cooler that is a jack-of-all-trades but a master of none. Which one you choose will depend on what you’re planning to use it for, how much you’re willing to spend, and how long you want your ice to last. Hopefully, you now have a better idea of the many different coolers that are out that have the added benefit of having wheels. 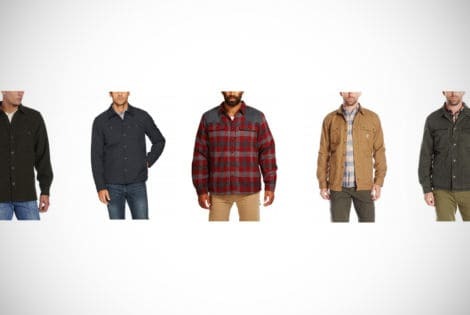 This will allow you to make a more informed decision as to which of them to go for. As much as we love cold beer, this really isn’t the only thing you should be considering. If you’re still not sure which is the best cooler with wheels for you, go and read through the reviews again as we’re sure you will finally find the cooler of your dreams. We know you’ll not regret your decision whichever one you finally decide to go for.